Mr. T had the day off Friday so he met me for a late lunch around 3:00. I was working in Greenwich Village about 4 blocks from the newly opened Bill’s Burger Bar so it seemed like a no brainer. Bill’s Burger Bar is the new BR restaurant group place that moved into the old Hog’s Pit space. We used to frequent the Hog’s Pit a decent amount back in the day. Mr. T’s brother was on a foosball kick for a while and this was one of the places that always seemed to have some exciting foosball action. It was always a fun place to hang out but a little dirty and divey. Walking into Bill’s on Friday I noticed the room was actually bright! I tried to recall if there were shades on the windows at the Hog’s Pit or if it was just really dirty. Here the windows let in a ton of sunlight and the place had a cheery diner like feel to it. The tables were covered in picnic style checkered cloths and some good rock and roll music playing in the background. We got a seat in the back room and placed our order. 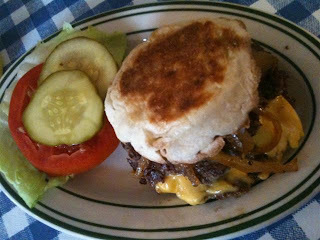 The first burger I tried was the classic Bill’s burger with American cheese. First things first, this burger came out looking like a UFO! It was super thin and wide. They cook the 5 oz Pat La Frieda meat here on a griddle using a technique of smashing the meat on both sides with a spatula. The result it a big flattened burger with super crispy edges and a nice salty char to the outside. I absolutely loved this burger. My favorite part of the Shake Shack burger is the crispy edges and this had a ton! I don’t know how the burger stayed so juicy and moist even when it was cooked far beyond my normal medium rare. I kept licking my lips to enjoy the salty beef aftertaste! I tried to put some of my toppings on the burger however and it just didn’t work out. The tomato and pickle were almost too thickly cut for the super thin burger. I enjoy the Shake Shack’s topping to meat ratio much better. The other burger we tried was the Fat Cat. 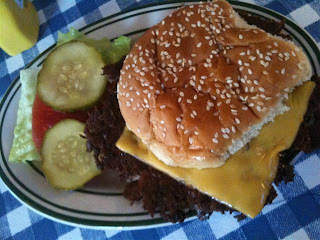 This is actually a burger with two patties and has cheese layered between the middle. 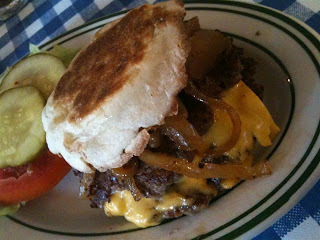 It’s served on an English Muffin bun and topped with some caramelized onions. Look at this juicy burger shot! This burger was very good as well. The onions gave the meat a nice sweet flavor but I didn’t get the same salty crunch as I did with the Classic. 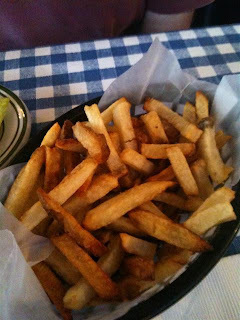 The order of fries we split were good but nothing special. They could have been cooked a little bit longer so each one was uniformly crisp. It truly didn’t matter to me though- I was too busy swooning over my Bills’ Classic burger. The only thing I thought was a little weird was the empty ketchup bottles on the table. I’ve never been to a place where I had to try 3 different bottles of ketchup before finding one with some inside. That may just be a minor opening month issue that will be resolved soon. Bill’s Burger may not be for everyone. Mr. T liked both of the burgers but said he prefers a thick burger with a little bit more going on. I loved Bill’s and for the price point think it’s a welcome new addition to the neighborhood. Each burger was $5.95, which is a great deal anywhere but especially in the Meatpacking District. I’m not ready to put Bill’s into my top 5 burger category until a few more visits but it’s definitely a contender.